But I feel like 50, or 40, or 30! Today Marilyn said, "Happy Birthday," when I woke up. "Oh, yeah," I said. "It is my birthday." That may not have been as polite as saying, "Oh, thank you!" But, whatcha gonna do when your brain is not fully engaged yet? 67. Who woulda thunk it? I remember being somewhere between 10 and 12 and thinking that I would be 50 when our calendars turned to the year 2000. It didn't matter that I would turn 51 just 16 days later. With a child's enthusiasm for math, I liked the fact that 50 and 2000 were both nice, round numbers, one divisible by the other with none of those pesky remainders. But 67? Who woulda thunk it? I only vaguely thought of 67 when I turned 66. It is the next sequential whole number, after all. I can no longer get my kicks on Route 66. That joke may be obscure to some of my younger friends (and to my wife from CA, who finds my sense of humor alien). So, why do I feel like 45 or 50? (If not for decreasing physical capabilities after age 50, I'd still feel like I was 30.) It's not that I'm a person who tries to erect a levee to hold back the hundred year flood (of age). I know I'm going to die one day and accept it. It might even be today, at exactly 67 years of age. Or maybe it won't be until I'm 100 and the year turns 2050. Two more round numbers, though not as beautifully symmetrical as 50 and 2000. Of course, one reason I still feel like 50, or 40, or 30 is that I'm still in good overall health. Another reason is that I've had a wonderful partner for the past 31+ years. Then there's the fact that I live in Ecuador, where enjoying life in the present is more important then anticipating the next big milestone (job, love, trip, etc.) - a lot like New Orleans was when I grew up. My friends and family are a joy to be around. I'm friends with people who are my age and older, as well as many who are younger, often substantially younger. This forces my mind to be more elastic. Come to think of it, though, if I have Alzheimers, I don't know it. (Maybe I should start putting that last sentence on the tag line of my emails.) I've had a great job, which allowed me to retire at age 55. I still travel a good bit, adding to a treasure trove of memories and experiences. I still look forward to tomorrows. Unlike Ponce de Leon, or whoever it was searching, searching, searching for immortality, I've found the Fountain of Youth. I know that's true when I read the above paragraph. My birthday fell on a Saturday this year - a perfect day to have a party. 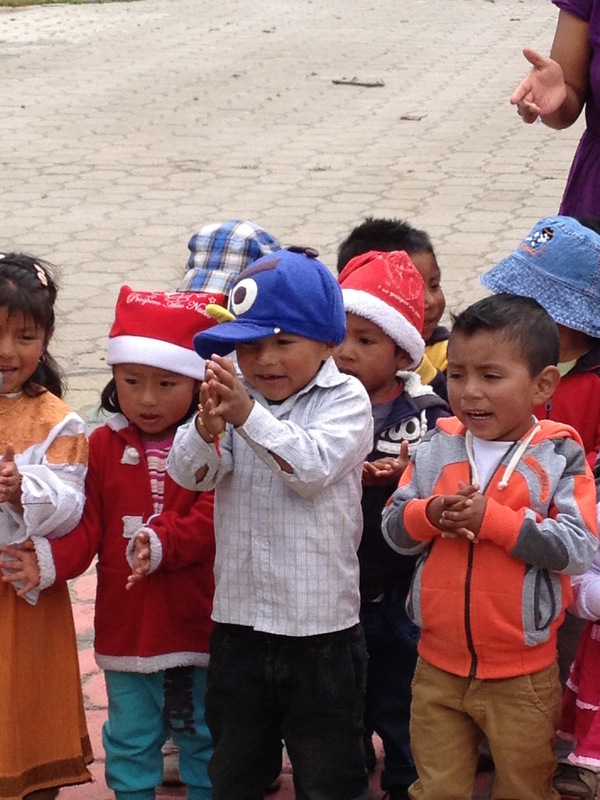 I've had some great birthday parties in Ecuador, but this year I wanted to skip it. Imagine that. A New Orleans boy bypassing a party. Stranger things have happened. But, I did want Marilyn to bake me a cake. She makes good cakes, even at an altitude of 8,400 ft. And, I can custom order what I want (yellow cake with orange and lemon, with a coconut frosting this year). We also had a special breakfast including sticky cinnamon rolls and Yummy Eggs this morning. 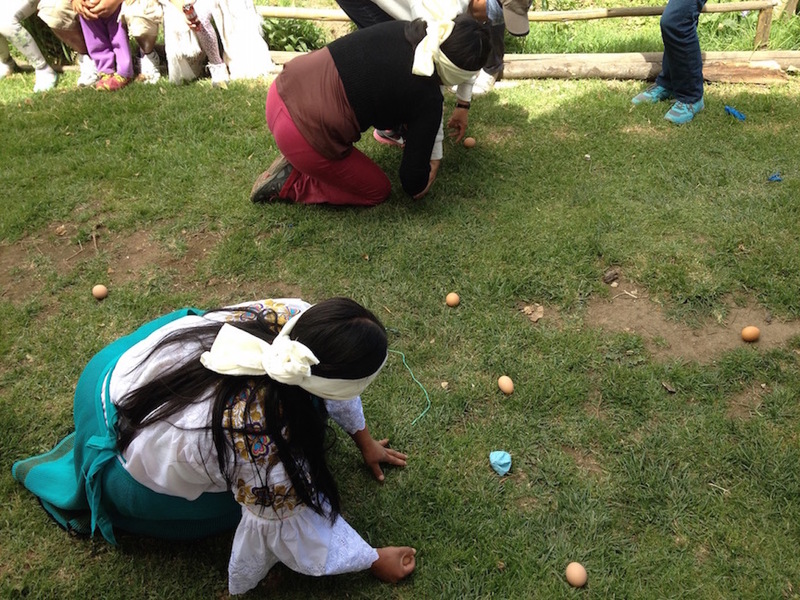 If you don't know what Yummy Eggs are and want to try them, you'll have to come to Otavalo, Ecuador (even though it's a recipe from Marilyn's childhood). To top things off, the new blinds I ordered for the office were installed today and are wonderful. Also wonderful are the LSU shirt Marilyn gave me and the box of bonbons our Ecuadorean family gave me. Party? I don't need no birthday party to be happy. Maybe next year. Oh! And there are two NFL playoff games today. The only way the day could get better would be for my pathetic but beloved New Orleans Saints to be in one. And then win it! But, like I said, maybe next year. Yesterday, the idea of writing a blog post about turning 67 was not born, hatched, conceived. It was born and grew (to maturity?) only when Marilyn wished me a happy birthday this morning, before I had any inkling that I was officially another year older. You have her to thank for this blog post, or not. So, here's to being 67 years old! It may be memorable only for this blog post, but it's a definite fact of (my) life. Now, where's my glass of wine? Happy Birthday! Sounds like life is going really well. Please tell Marilyn "hello" from us. We love Colorado; family, the mountains, four seasons, great schools and lots to always do! Take care! How wonderful to hear from you! Thank you for your fun, sweet birthday thoughts and the nice photo. Have a beautiful New Year. Blessings and hugs. Hope our paths cross again. Effi & Co.
Hello Glenn and Marilyn and Happy Birthday to you Glenn! I love reading your posts, hearing the Good News, and seeing pics of you and your friends. You are blessed! Would you believe Jasmine & Jamal are about to turn 16!!!! Much love and prayers for you both! Good to hear from you, Glenn. Hope you have a happy birthday, and another great year. !Que disfruten cada dia este ano, Glen y Marilyn! Glen, you are an inspiration. Thanks for the post. HAPPY BIRTHDAY--and may you have many more!! What a great picture of you. You are as young as you feel, so that gives us lots of leeway in our life journey. Maybe the Saints and the Dallas Cowboys will have a playoff game next year! YAY! Saints & Cowboys? You're more of a dreamer than I am! I used to be feel confident saying I couldn't die until the Saints won the SB. After SB XLIV, I changed my tune. Now I say I can't die until the Saints win 5 SBs. That ought to keep me kickin' for a while longer. The trip we're planning this summer is called OFGG (Old Farts Grand Getaway). We'd like to call it FOGG, but can't think of a title to fit that acronym. Hey, I remember yummie eggs! Doris would fix them when I had breakfast at Marilyn's house when we were teenie boppers. Hey I am still 66 for 6 more months. My gosh seems like only yesterday Marilyn and I would walk to and home from school. Time does indeed fly! What kind of car did you end up getting? Yes indeed? Yummy eggs are a fine thing. We bought the same model car as our old one. It's just 7 years younger and has air conditioning that actually works! Everything else works, too! For many of us, the holidays can be complicated when it comes to where to celebrate. Glenn and I have compromised by agreeing to spend Christmas every other year with our families in the States and the off years with our adopted family in Ecuador. In 2015, we spent Thanksgiving with my family in California, the week after Thanksgiving with Glenn's family, and Christmas time here in Ecuador. Our flight from the U.S. back to Quito brought us home in time for the second of nine novenas that Isabel's family celebrates before Christmas. We get to be part of that. 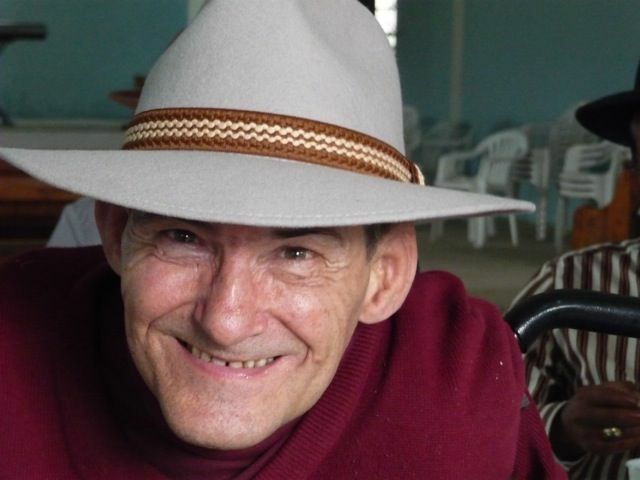 This year, all nine gatherings were at our house where there is enough room for a large gathering and no one has to carry Glenn and his wheelchair up several flights of stairs. The novenas were a time for sharing, for reflecting on the season and it's purpose, and for strengthening family ties. The events this year felt far different from last year. In 2014, Victoria's health declined to the point that Isabel's care for her mother was no longer sufficient because she couldn't physically do all that needed to be done. This caused a lot of stress among Victoria's children when deciding how to handle the situation. Not everyone agreed with the final decision, resulting in tension that lingered through Christmas 2014. Since Victoria passed away this last May and both the one and six month anniversary remembrances had passed, all of that tension was "water under the bridge" by Christmas 2015. 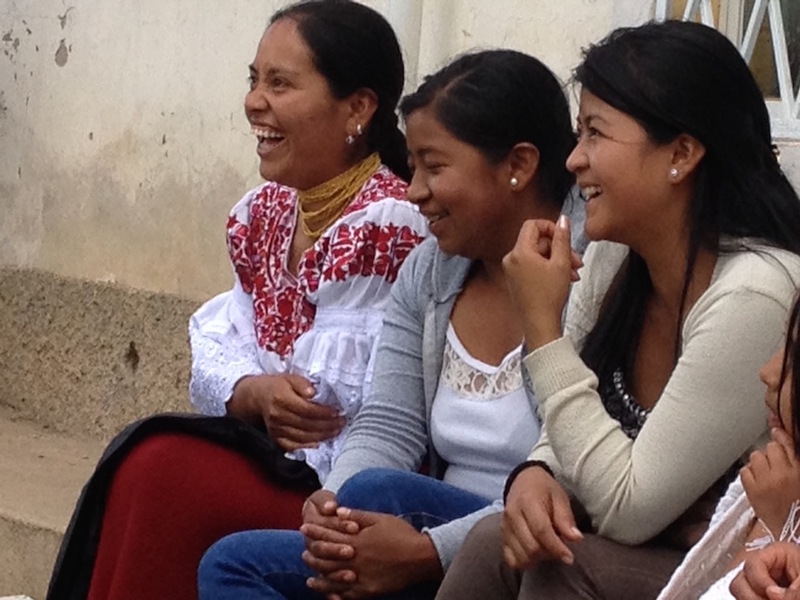 The novenas were a happy time to recite the Catholic rosary and share food afterwards. We averaged 12 adults and 6 children and youth in attendance each night. 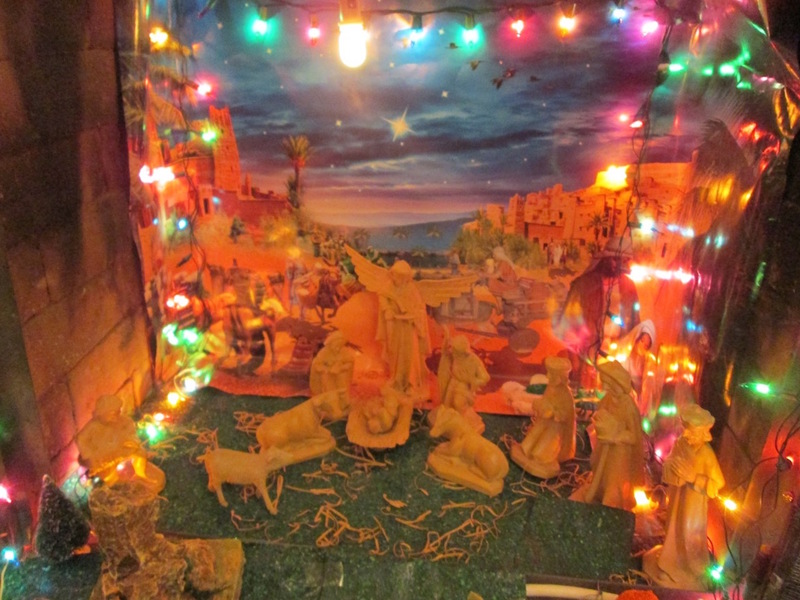 On the evening of the 24th, the extended family attended the Christmas eve service at the Catholic church Victoria liked to go to - the cathedral in town center instead of the newer church next to the pan american highway where the family usually worships. 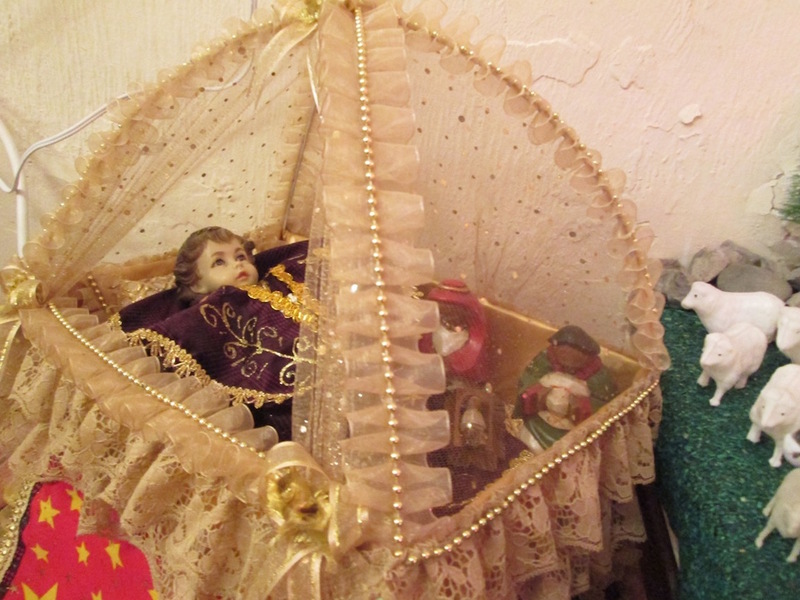 One of the interesting customs here in Ecuador is that most Catholic families have a baby Jesus that often receives a new robe each year and is carried in a special bed both to any novenas as well as Christmas services. At the end of the service, the priest blesses all the babies placed on the steps to the altar by sprinkling holy water on them. They are lovingly carried home and cared for throughout the year. with his parents behind him. Even though Thanksgiving is a U.S. holiday, I enjoy serving a traditional dinner when in Ecuador. 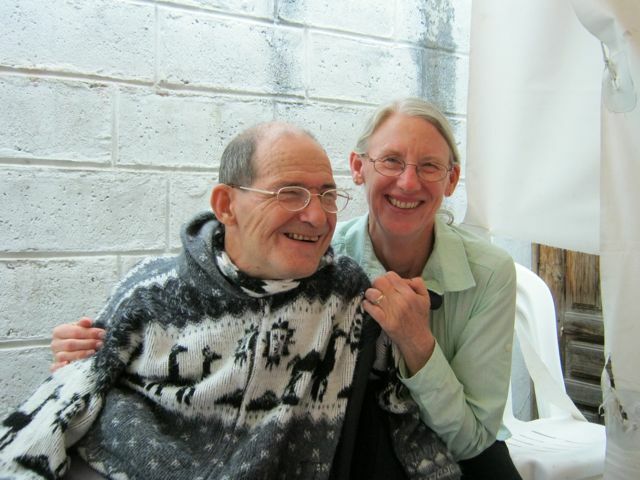 In 2015, we were in the U.S., so it was not an option to serve turkey and dressing on that day here in Otavalo. I decided to serve turkey on Christmas day instead. We invited everyone who came to the novenas and a few more friends. The 11 kilo (24 pound) turkey was delicious and well received. Even though I made four recipes of stuffing, none was left after the meal. Cranberries are not grown in Ecuador and it is near impossible to buy cranberry sauce here. We usually have dried cranberries that we bring back from the States on hand. Boil in water and add sugar to taste: This results in a perfect cranberry sauce. Add turkey gravy and a salad or two. Voila! Christmas day dinner was great and everyone enjoyed relaxing afterwards. I suspect you are wondering when the celebrating might end. Well, not quite yet. 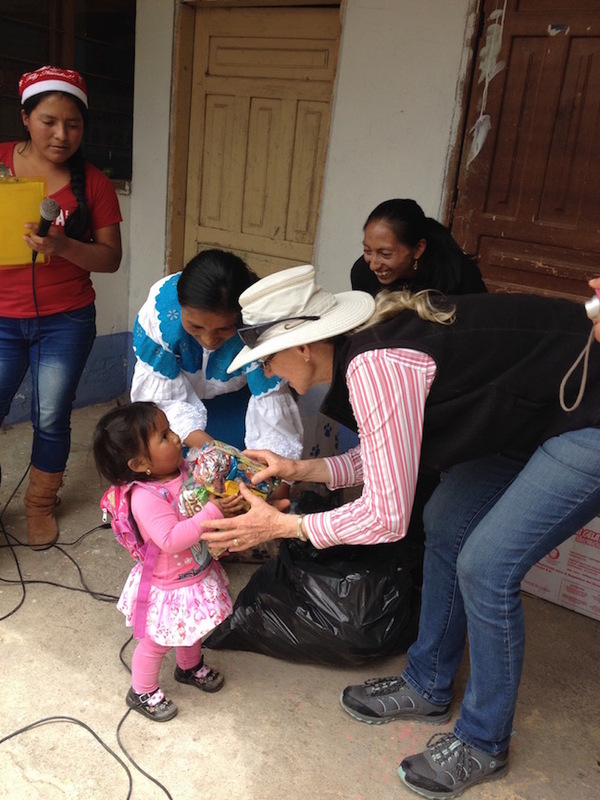 On the day after Christmas, I went to Pijal Centro, where the women's group celebrated with a meal and a gift. FEDICE staff members were invited because FEDICE is assisting this group to open a Cooperativa that can loan money to the community. Of course, the meal wasn't eaten until a number of games had been played. 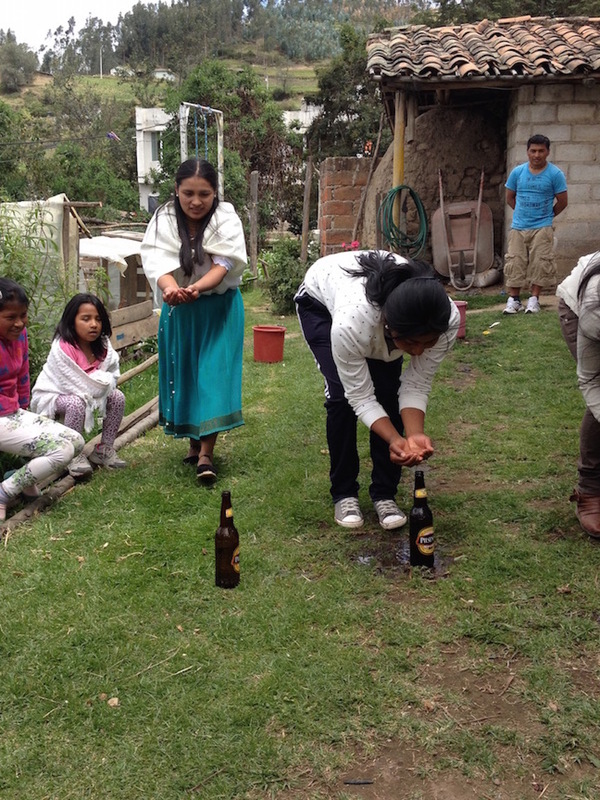 To an Ecuadorian, what's a Christmas party without games? Who can fill up the bottle with water first? Who can find the most eggs? Games in Pijal Centro. Then on Sunday, December 27th, Isabel's oldest brother had his traditional party. Alfredo pretty much stays to himself and usually does not participate in many family activities. But he always throws a Christmas party. As is usual, he hired three different bands to play throughout the all day event. It started with a priest saying mass, then moved on to music, dancing, and eating. We left in the afternoon to put flowers from the party on Victoria's grave, but it likely continued into the night. And that is the end of our 2015 holidays (except for New Year's Eve when we walked around downtown to see the dummies that represented ill happenings during the year, which would then be burned at midnight). My mother asked me if we had a party on New Year's Eve or had people over on New Year's Day. I laughed! No, we didn't. It was good to have some time to relax and recuperate! P.S. 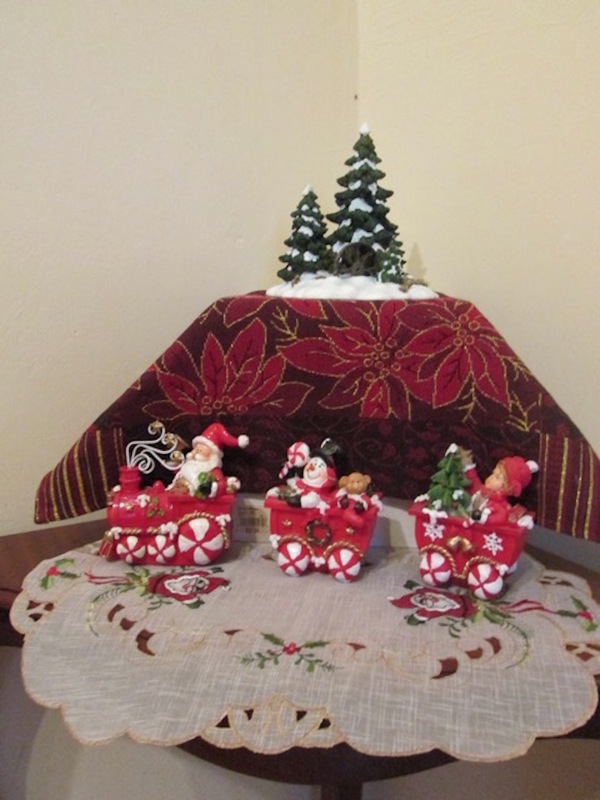 Here are some pictures of decorations in our home and pre-schoolers at their Christmas Parties. Isabel does a great job of decorating! 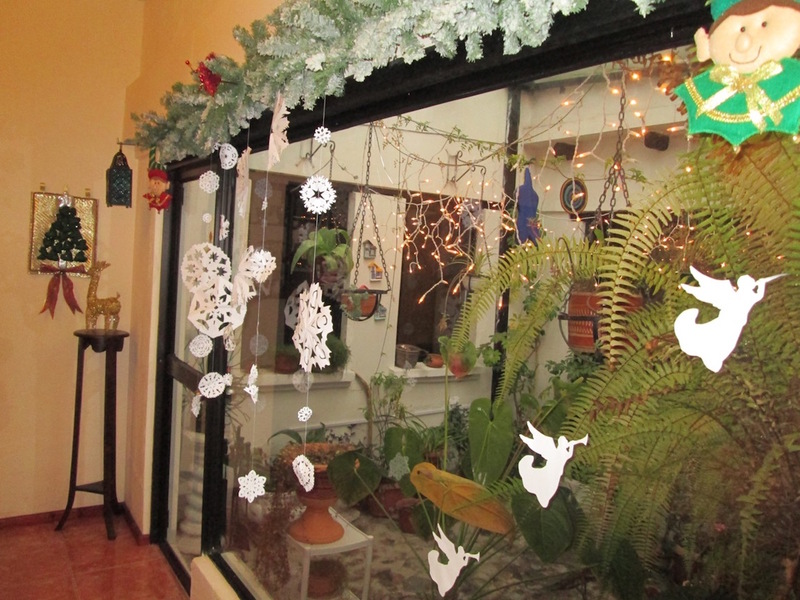 This is the window from the dining room into our atrium. but Isabel found a great use for it this year. 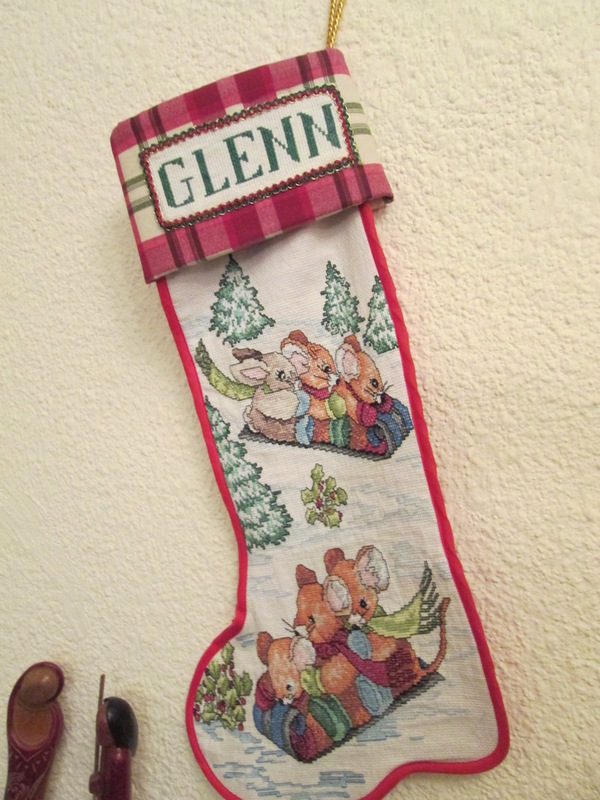 Isabel worked on Glenn's stocking all year long. It is cross-stiched and was Glenn's Christmas present. Part of the decorations in Glenn's office. at her Christmas party in Inty Huaycopungo. at their party in San Augustine.